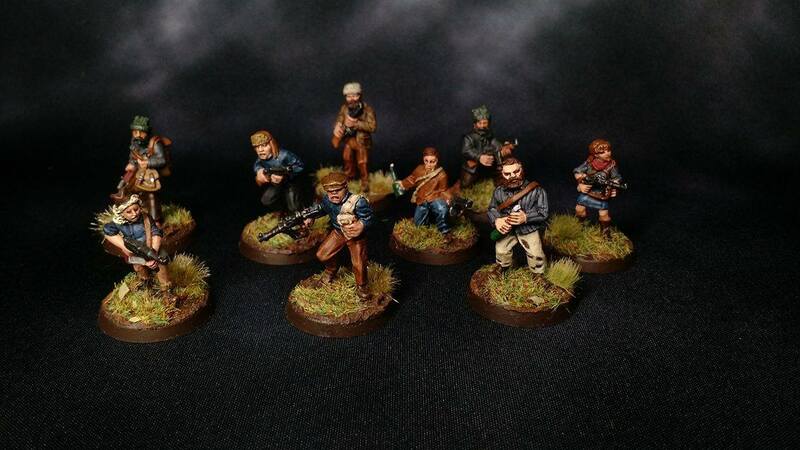 Since my last WIP post almost all of my hobby time has been spent painting up partisans for Bolt Action. That work continues as Andrew and I are starting to reach the home stretch for our Adepticon Doubles team tournament army. Painting this army has been both fun and little challenging. 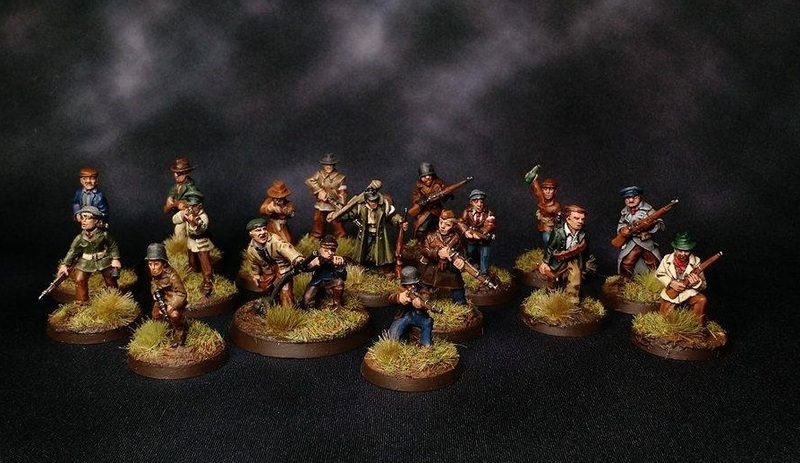 They are a fairly colorful lot, which is a big change from other historical-based armies that I’ve done. Normally you tend to be painting drab, earthy colors almost the entire time (as would be expected, since fatigues don’t tend to be designed to stick out from your surroundings, that’s a good way to get yourself killed). Normally it’s easy to just go ahead and batch paint the models, grab your five and then do all the pants, all the helmets, on and on and on until you’re complete. We’ve still been snagging five at a time for our batches, but while doing the actual painting you’ll have different colors on your pants, different types of coats, different hats, so on and so forth, which slows you down significantly. But that has also made the army far more interesting to paint, and it’s been a lot of fun. Adding to this is the fact that we’ve collected models from nine different companies for this project to add some uniqueness and limit the duplicates in the force, so I’ve almost never painted the same model twice, which is a huge change from normal army painting, especially one made up entirely of metal minis. There have been a few spots where the scale of the different miniature companies has been noticeable, but for the most part when combined into the horde it’s hard to pick them apart without close examination. And as we continue to say… the resistance comes in all shapes and sizes. My portion of the army consists of a few rifle squads, a veteran squad with SMGs, and a few of our teams including a sniper, a mortar, and a flamethrower team. 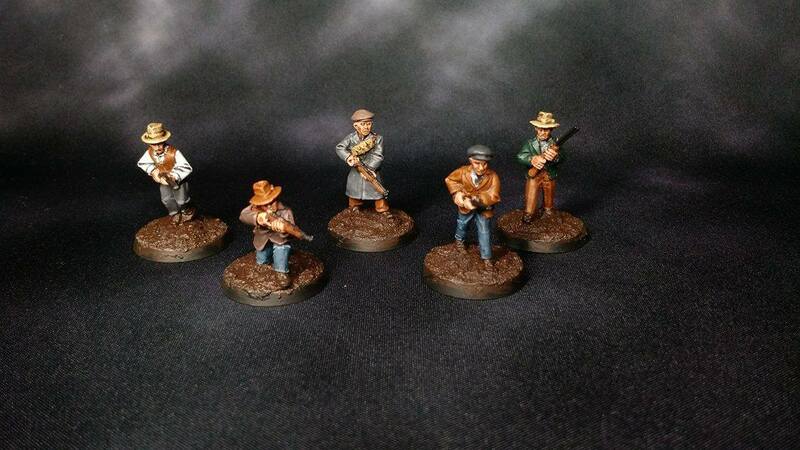 Below are some of the completed riflemen along with the flamethrower. The veteran squad is a smaller unit that gets the special tasks, filled with folks who have survived with the resistance for a while and have accumulated a variety of weapons, some captured from the enemy, and some supplied by sympathizers in the outside world. I’m currently finishing up another batch of five riflemen and should have them done in fairly short order, and then it’s on to the next set. As of writing Andrew had told me that we had 10 riflemen left for my force, so assuming I’m able to keep myself on task I should be finished by the end of next week. 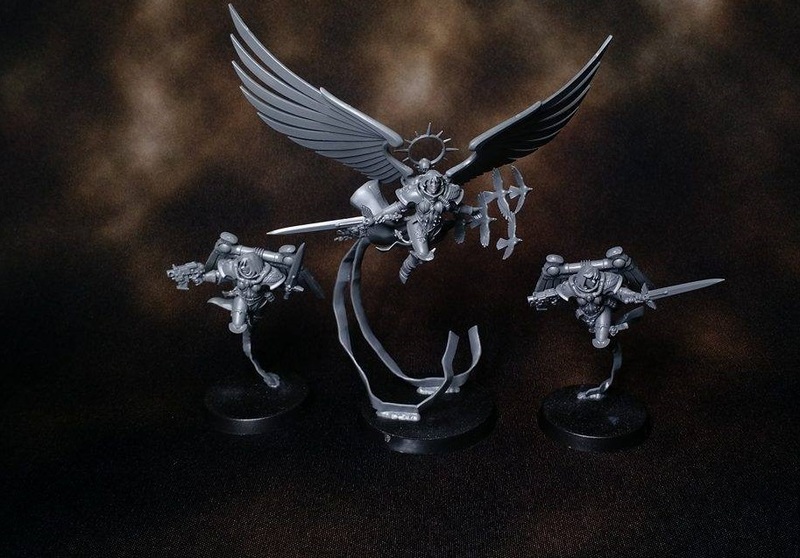 The one indulgence I gave myself that went outside of the Partisan Project was building Saint Celestine and her Geminae Superia, as well as Inquisitor Greyfax from the Triumvirate of the Imperium box. I won’t be putting any paint onto these ladies until after Adepticon, but I wanted to get them built so I could see them for myself. It’s difficult to leave a box sealed when it’s got that plastic crack inside. Thanks! We’ve been having a wonderful time getting this army painted up.